Some time ago, when researching a talk, ‘No Vote No Census’, that I gave in October 2011 conference on the 1911 census organised by the National Archives, I came across the boycotting census form of Mrs Frood of Topsham. Since then I have passed on this discovery to a researcher associated with Topsham Museum who has been able to link Mrs Frood directly to the 1913 Suffrage Pilgrimage, the 100th anniversary of which is being celebrated in Topsham today, 4 July 2013. The census enumerator, Mr.H. J. Baker, reported this act of civil disobedience to the Census Office and received a reply from its Secretary, Archer Bellingham, instructing him to fill out the form with the best information he could muster. Mr Baker then annotated the letter, quoting Mrs Frood as saying to him that she had had a ‘house full’ of boycotters on census night – and ‘that I am therefore adding to Numbers 6’. With this number revealed as an arbitrary choice of the enumerator, we can only speculate as to how many Topsham women spent the night at Little Broadway House in Station Road. Although in 1911 it would appear that Mrs Frood, as a correspondent to Votes for Women, was a supporter of the WSPU, by 1913 she is listed in The Suffrage Annual and Women’s Who’s Who as secretary of the Topsham branch of the NUWSS. Perhaps she was one of those who were dismayed by the WSPU’s increasingly militant tactics. It was one thing to paint slogans (with ‘good’ paint’) on pavements and walls, but quite another to break windows and commit arson. So it was as a leading local NUWSS member that Mrs Frood took part in the Suffrage Pilgrimage in early July 1913. Mrs Mary Catherine Isabella Frood (nee Campbell, c. 1856-1931) had been born of Scottish parentage in Canada and was living in New Zealand when, in 1878, she married James Nicholson Frood (d. 1913), an Irish-born doctor. She had five children, the first four, all daughters, born in New Zealand and the last, a son, born at sea c 1888 – presumably as the family was returning to England. One of her daughters, Hester, was successful as an artist. 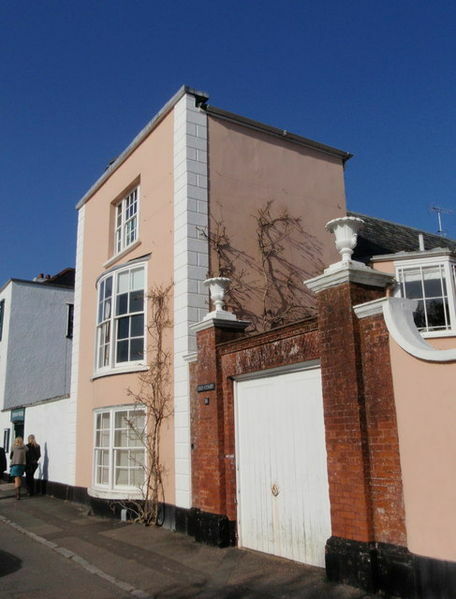 Although Mrs Frood actually died in London, her address was still in Topsham – 26 The Strand (Old Court House). Where was Dr Frood in 1911? Dr Frood was living with his family (whose name was misrendered as ‘Froud’) when the 1901 census was taken. But where was he in 1911? The name on the cover of the census form had been written as ‘Dr Frood’, but this had been amended to ‘Mrs Frood’ and it is she who is shown as ‘Head of Household’. I can find no trace of James Frood elsewhere in the 1911 census, although he did not die until 1913, his death registered in the local area. Interestingly under the terms of his will probate was granted to the Public Trustee rather than to his wife or any other member of the family. Where was Little Broadway House? Thanks to Street View I can see Station Road and the pavement along which Mrs Frood painted her slogans. Thanks to Paul Tucker (see Comment below) who tells me that Little Broadway House is still there – the house with the overhanging upper window that I can see in Street View – although now divided into two. Presumably the ground to its side was Mrs Frood’s field. So let’s take a moment to visualise its gates – decorated with Votes for Women cartoon – a reminder to those walking past on their way to the station that one Topsham woman was prepared to do her bit to win ‘votes for women’. This entry was posted on July 4, 2013, 12:11 pm and is filed under Suffrage Stories. You can follow any responses to this entry through RSS 2.0. You can leave a response, or trackback from your own site. Very interesting, thank you. Perhaps Mary Frood may have been influenced by her early years in New Zealand where suffrage for women was secured pre WW1 (across the ditch from Australia). I liked the detail of her move from WSPU to NUWSS, a topic that Jo Vellacott discusses in her books so well. Yes, I wondered whether to make just such a point – but actually Mary Frood left NZ 5 years before women there were given the vote – so I didn’t feel I could justify such an inference..
Little Broadway House is still very much in existence, albeit it is now split into two properties, and has been renamed, one of these being Gableside. (It is a large brick property with overhanging upper window). Many thanks, Paul. Just the kind of information I like! I’ve amended the post accordingly. A minor point – 26 Strand, not “The Strand”. Correctly named on Ordnance Survey street mapping, incorrectly on many others, including the Royal Mail’s postcode finder. Little Broadway has not been divided. The house was extended in the 1920s, and it is the extension that has been separated off into a separate dwelling. The extension is now “The Gables” and Little Broadway is now “Gableside”. The ground to its side is garden, not a field, and was originally the orchard garden of Broadway House. There was no gate in the garden wall until I had it put in, so the gates she painted on were elsewhere. There was a field between the end of the garden and the railway line, and I think that was shown on the deeds as Dr Frood’s property. When Mrs Frood died in 1931 her address on the Probate Register was given as ’26 The Strand’..presumably how it was known at that time. And many thanks for the other geographical details.